We compared cultural practices commonly used in bean (Phaseolus vulgaris L.) and other vegetable cropping systems to assess the effect of individual as well as combinations of practices on bean stem maggot (BSM) (Ophiomyia spp. Diptera: Agromyzidae) infestation and subsequent damage to bean plants. The cultural practices used included mulching, application of fertilizer and chemical seed dressing. Chemical seed dressing reduced pest incidence during early growth stages and enhanced plant survival. Mulches and application of fertilizer did not reduce pest infestation but enhanced plant tolerance to the pest; it also reduced subsequent plant mortality compared to the control. Combinations of these practices were even more effective in reducing BSM induced plant mortality and increasing crop yield. Their efficiencies varied with location. Des pratiques culturarles communément utilisées dans les systèmes de culture du haricot (Phaseolus vulgaris L.) et d'autres végétaux ont été comparées pour évaluer l'effet des pratiques individuelles ou combinées sur l'infestation de la mouche du haricot (Ophiomyia spp. Diptera: Agromyzidae) et les dégâts causés aux plants du haricot. Les pratiques culturales utilisées comprenaient le paillage, l'application des engrais et le traitement des semences. Comme attendu, le traitement des semences avec les produits chimiques a réduit l'incidence de la mouche au début des stades de croissance et a augmenté la survie des plants. Les paillages et l'application des engrais n'ont pas réduit l'infestatuion de la peste mais ils ont, au contraire, augmenté la tolérance à la mouche et réduit la mortalité des plants par rapport au contrôle. Les combinaisons de ces pratiques étaient encore plus efficaces en réduisant la mortalité des plants induite par la mouche du haricot et en augmentant le rendement en graines. Cependant, leur efficacité variait avec le milieu. Over 80% of beans in sub-Saharan Africa are grown in marginal environments where soils are impoverished, but little external inputs are used to improve crop growth. In these regions beans are traditionally grown by small-scale farmers. Their land sizes often do not exceed 1 ha and as such do not rotate crops or allow fallow periods. This leads to a build up of pest and diseases. Bean stem maggot (BSM), also known as bean fly (Ophiomyia spp., Diptera: Agromyzidae), is the most important pest of beans in such systems; the insect is also the principal pest of beans in Asia and Oceania (Le Pelley, 1959; Greathead, 1968; Talekar, 1990). Three species which attack beans have been recorded from Africa. These are: O. phaseoli Tryon, O. spencerella Greathead and O. centrosematis (de Meij.). The adult oviposits in leaves, stems and hypocotyl of young seedlings. Emerging maggots mine their way to the root collar where feeding becomes concentrated between the woody stem and the epidermal tissue. Such feeding interfere with nutrient transport and creates avenues for the entry of disease organisms. BSM damage is most severe and often leads to mortality when seedlings are attacked. Older plants are able to survive the attack better, but become stunted and yields are depressed. In plants under stress, such as may result from soil infertility or drought, BSM attack may lead to a total crop failure. Losses in the range of 30-100% are frequently reported in Africa (Greathead,1968; De Lima, 1983; Autrique, 1985; Karel and Matee, 1986). Current control recommendations rely on chemical pesticides applied as seed dressings before sowing, or foliar sprays soon after plant emergence (Lays and Autrique, 1987). These applications may effectively control the pest but many of the recommended chemicals are banned (e.g. endosulfan and lindane), or are too expensive or un available (e.g. abamectin) to the average small- scale bean grower in Africa. Sustainable control approaches for such farmers must lean on tactics and/or products that can be regenerated within the farming environment. Such tactics include cultural methods used in the production of other crops, host plant resistance and use of plant extracts with insecticidal properties. Cultural practices are used by farmers to escape pest infestations, enhance crop growth and promote tolerance to infestation or reduce suitability of the environment for rapid population development. In this study, we tried to quantify the effect of certain cultural methods on BSM infestation and damage to bean plants. Field studies were conducted in the 1992 and 1993 short growing seasons at two locations in northern Tanzania: Sinon in Arusha District and Mabughai in Lushoto District. These sites differ in soil fertility, the latter being less fertile, a parameter which also affects plant ability to tolerate BSM damage. Land preparation was by ox-plough at Sinon and by a forked hoe at Mabughai. At both locations, the field was leveled before sowing. Sowing was done in furrows about 3 cm deep, at 15 cm apart, and covered. Plot size was 9 rows spaced at 50 cm apart and 5 m long. This gave a population of 134, 000 plants ha-1. Such low plant populations favour BSM infestation (Abate, 1990) and were used in the trials to enhance infestation. Fertiliser application treatments were made to their respective plots before sowing. Mulch was applied immediately after sowing. The trial was laid out in a randomised complete block design. The common bean variety "Lyamungu 85" was grown. Moisture was limiting during the cropping period at both locations, but at Sinon this was reduced by the application of supplemental furrow irrigation. 1. Enhanced soil fertility (F): additional organic fertilizer applied at sowing and side dressing at 30 kg P2O5 and 60 kg N per ha. 2. Mulches (M): the spreading of dry banana leaves (in Sinon) or dry bracken fern leaves (at Mabughai) to a layer approximately 4 cm thick over the plots after sowing. 3. Endosulfan seed dressing (E) at 5 g of endosulfan 47% mixed in a slurry with 1 kg of wetted seed before sowing. 5-8. Various combinations (M+F, M+SD, F+SD and M+F+SD) of the individual treatments were applied. The plots were weeded. Data were collected on plant emergence, plant mortality due to BSM as well as other mortality factors, and agronomic performance indices such as vigour, dry matter accumulation and grain yield. All dead plants in each plot were counted and removed on each sampling occasion. They were then examined for cause of mortality (i.e. mechanical damage, disease induced mortality, BSM induced mortality and others). BSM infested plants were dissected to estimate the levels of infestation and the composition of the prevailing BSM species. The data were subjected to ANOVA as distinct treatments and means were compared using the SNK procedure. BSM infestation and subsequent plant mortality were higher at Mabughai than at Sinon. At Mabughai, BSM infestation levels in the non-endosulfan treated plots ranged between 9 and 12 insects per plant; plant mortality levels ranged from 81 to 232 plants per plot (34 and 95 % of total plant population, respectively) (Table 1). Infestation and subsequent plant mortality in the endosulfan treated plots were significantly (P<0.05) lower. This trend was repeated at Sinon but the differences were non-significant (Table 2). BSM infestation levels were the highest at about 3 weeks after plant emergence (WAE) at Mabughai (Table 1). Infestation at flowering (6 WAE) or later followed no definite pattern. This may be due to the inability of endosulfan to deter BSM infestation as endosulfan concentrations in the plant tissues at this stage may be sublethal (less than 0.5 mg/kg) (Autrique, 1989). While infestations at flowering or later developmental stages may interfere with nutrient transport and cause stem weakening and subsequent lodging, they do not cause plant mortality directly. Among individual non-endosulfan treatments, mulch and fertiliser reduced plant mortality significantly (P<0.05) below that of the control at Mabughai (Table 1). Mulch also delayed mortality but did not reduce BSM infestation. However, all the treatment combinations (including M+F) reduced plant mortality below that of endosulfan alone at Sinon (Table 2). Plant mortality was significantly correlated with BSM infestation at 3 WAE (r2 = 0.47, P<0.01). None of the treatments had any significant effect (P<0.05) on plant establishment at emergence even though enhanced fertility, mulch, and M+F appeared to improve it (Tables 3 and 4). Also, the combined treatments of mulch and enhanced fertility (M+F and E+M+F) increased plant vigour as measured by canopy height and canopy width at flowering (Table 4). Fertiliser treatment enhanced plant tolerance to infestation and positively influenced yield parameters such as pods per plant and overall seed yield, especially at Mabughai (Table 3) where the soil was generally infertile. At this site, the highest yielding treatments were EMF, MF and EF. These were significantly (P<0.05) different from all other treatments but not from each other. BSM species composition was similar at both sites, with O. spencerella being dominant (>80% of total population). BSM infestation and its associated plant mortality was higher at the less fertile environment (Mabughai) than at the relatively more fertile environment (Sinon). The effect of enhanced soil fertility on the ability of bean plants to tolerate BSM attack was demonstrated by Autrique (1989). Possibly, because of the higher soil fertility at Sinon, the effect of the additional fertilizer application was not as pronounced as in Mabughai. At Mabughai, treatments with enhanced soil fertility reduced plant mortality and increased yield (mean fertilizer treatments 517.4 kg ha-1 compared with treatments without fertilizer of 194.5 kg ha-1). This effect was also reflected in other agronomic parameters associated with yield (e.g. pods per plant) but not in reductions in BSM infestation levels. Fertiliser combined effectively with most of the other treatments to reduce plant mortality beyond that of fertilizer or mulch alone, in spite of the fact that both treatments failed to reduce BSM infestation levels. This implies that fertilizer applications or soil fertility status per se does not protect plants against BSM infestations, but improves the plants' ability to tolerate the infestation. Farmers use a variety of traditional methods to manage pests, diseases and other constraints in crop production systems. In many instances, one strategy may have diverse benefits to the crop. Mulches are generally considered to improve soil and water conservation and to help control weeds (Ackland, 1971; IITA, 1992). Grass mulch is used routinely by vegetable growers in Lushoto District to conserve moisture. 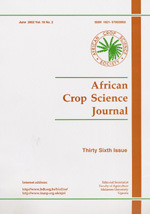 Ngoli and Tarimo (1985) observed no direct significant effect on bean yield in Tanzania, but in Malawi, Letourneau (1994) observed a reduction of BSM infestation and subsequent plant damage in mulched plots. In the present trial, mulching increased yield seven times above that of the control at Mabughai possibly because of low pest incidence and more fertile soils at this site. The combination of mulch plus fertiliser was among the best two treatments tested (including treatments with endosulfan seed dressing) in terms of grain yield at both locations, and doubled the yield over that of chemical seed dressing. This treatment combination did not reduce BSM infestation per se, it appeared to promote plant vigour and tolerance to attack and reduced plant loss resulting from infestation and damage. Mulches are reported also to reduce bean infections by web blight (Galindo et al., 1983) which may also aggravate the BSM problem. In our trials, we have used the most common mulching material in either environment. However, because of the additional labour requirement in the carting of mulching material to the bean fields and the competition between this and use of potential mulch material for animal feed, this procedure is unlikely to be readily adopted by farmers for field production of beans. However, in certain production systems such as rice and other small grains, where excess straw becomes available after harvest, this management approach may be suitable on a large scale. In Costa Rica, farmers overcome the lack of availability of mulch material by broadcasting beans through weeds and cutting the weeds to cover them, a practice known as "frijol tapado" (Galindo et al., 1983). The practice reduces the labour cost that may be incurred in carting mulch material. Another amendment in the form of direct mulch practice would be through the use of herbaceous N-fixing legumes e.g. Mucuna puriens, various species of Crotalaria and Pseudovigna argentea which have been shown to have adequate nitrogen fixing abilities as well as biomass production for mulches (IITA, 1992). The use of these N-fixing legumes would provide the required N and mulch material to enhance bean plant tolerance to BSM attack. Abate, T. 1990. Studies on Genetic, Cultural and Insecticidal Controls Against the Bean Fly, Ophiomyia phaseoli (Tryon) (Diptera: Agromyzidae), in Ethiopia. Ph.D. Thesis, Simon Fraser University, Vancouver, B.C., Canada. Ackland, J.D. 1971. East African Crops. FAO/Longman, 1971. 252pp. Autrique, A. 1985. Les Ravageurs De La Culture Du Haricot En Afrique Centrale. Compterendu Du Seminaire CIAT-ISABU-IRAZ Sur La Production Et L'Amelioration Du Haricot Dans Les Pays Des Grands Lacs, Bujumbura (Burundi), 20-25 Mai 1985, Pp. 44-53. Autrique, A. 1989. Bean Pests In Burundi: Their Status And Prospects For Their Control. In: Proceeding Of The First Meeting Of The Pan-African Working Group On Bean Entomology, Nairobi, Kenya, Ampofo, J.K.O. (Ed.). Pp. 1-9. CIAT Africa. Workshop Series, No.11, Colombia. De Lima, C.P.F. 1983. Management Of Pests Of Subsistence Crops. In: Pest And Vector Management In The Tropics. Youdowei, A. And Service M.W.(Eds.) Pp. 246-250. Longman, London. Galindo, J.J., Abawi, G.S., Thuston, H.D. And Galvez, G. 1983. Effect Of Mulching On Web Blight Of Beans In Costa Rica. Phytopathology 73:(4) 610-615. Greathead, D.J. 1968. A Study In East Africa Of The Beanflies (Diptera: Agromyzidae) Affecting Phaseolus Vulgaris And Their Natural Enemies, With The Description Of A New Species Of Melanagromyza Hend. Bulletin Of Entomological Research 59:541-561. IITA, 1992. Sustainable Food Production In Sub-Sahara Africa. 1. IITA'S Contributions. IITA, Ibadan, Nigeria. 208 Pp. Karel, A.K. And Matee, J.J. 1986. Yield Losses In Common Beans Following Damage By Beanfly, Ophiomyia Phaseoli Tryon (Diptera: Agromyzidae). Bean Improvement Coope-Rative. Annual Report 29:115-116. Lays, J.F. And Autrique, A. 1987. La Mouche Du Haricot. Fiche Technique No. 008, Novembre 1987. ISABU. Le Pelley R.H. 1959. Agricultural Insects Of East Africa, E.A. High Commission: Nairobi, Kenya. 307 Pp. Letourneau, D.K. 1994. Beanfly Management Practices And Biological Control In Malawian Subsistence Agriculture. Agriculture, Ecosystems And Environment 50:103-111. Ngoli, G.P. And Tarimo, A.J.P. 1985. Effect Of Grass Mulch On Grain And Total Dry Matter Yield Of Field Beans (Phaseolus Vulgaris L.) In: Proceedings Of The Fourth Workshop On Bean Research In Tanzania, Minjas A.N. And Salema, M.P. (Eds.). Pp 29-34. Sokoine University Of Agriculture, Morogoro, Tanzania. Talekar, n.s. 1990. Agromyzid flies of food legumes in the tropics. Avrdc taiwan/wiley eastern limited, delhi.